See Olver (1997b, pp. 279–292) . As in §24.2, let Bn and Bn⁡(x) denote the nth Bernoulli number and polynomial, respectively, and B~n⁡(x) the nth Bernoulli periodic function Bn⁡(x-⌊x⌋). On the strip a≤ℜ⁡z≤n, f⁡(z) is analytic in its interior, f(2⁢m)⁡(z) is continuous on its closure, and f⁡(z)=o⁡(e2⁢π⁢|ℑ⁡z|) as ℑ⁡z→±∞, uniformly with respect to ℜ⁡z∈[a,n]. f⁡(z) is real when a≤z≤n. The first infinite integral in (2.10.2) converges. From §24.12(i), (24.2.2), and (24.4.27), B~2⁢m⁡(x)-B2⁢m is of constant sign (-1)m. Thus Rm⁡(n) and Rm+1⁡(n) are of opposite signs, and since their difference is the term corresponding to s=m in (2.10.4), Rm⁡(n) is bounded in absolute value by this term and has the same sign. where γ is Euler’s constant (§5.2(ii)) and ζ′ is the derivative of the Riemann zeta function (§25.2(i)). eC is sometimes called Glaisher’s constant. For further information on C see §5.17. In both expansions the remainder term is bounded in absolute value by the first neglected term in the sum, and has the same sign, provided that in the case of (2.10.7), truncation takes place at s=2⁢m-1, where m is any positive integer satisfying m≥12⁢(α+1). For extensions of the Euler–Maclaurin formula to functions f⁡(x) with singularities at x=a or x=n (or both) see Sidi (2004) . See also Weniger (2007) . For an extension to integrals with Cauchy principal values see Elliott (1998) . See Olver (1997b, pp. 295–299) . This identity can be used to find asymptotic approximations for large n when the factor vj changes slowly with j, and uj is oscillatory; compare the approximation of Fourier integrals by integration by parts in §2.3(i). 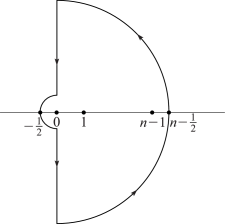 where α and β are real constants with ei⁢β≠1. which is a useful approximation when α>0. For extensions to α≤0, higher terms, and other examples, see Olver (1997b, Chapter 8) . See Olver (1997b, pp. 307–309) . The asymptotic behavior of entire functions defined by Maclaurin series can be approached by converting the sum into a contour integral by use of the residue theorem and applying the methods of §§2.4 and 2.5.
where 𝒞 comprises the two semicircles and two parts of the imaginary axis depicted in Figure 2.10.1. For generalizations and other examples see Olver (1997b, Chapter 8) , Ford (1960) , and Berndt and Evans (1984) . See also Paris and Kaminski (2001, Chapter 5) and §§16.11(i)–16.11(ii). See Olver (1997b, pp. 309–315) . What is the asymptotic behavior of fn as n→∞ or n→-∞? More specially, what is the behavior of the higher coefficients in a Taylor-series expansion? where 𝒞 is a simple closed contour in the annulus that encloses z=0. For examples see Olver (1997b, Chapters 8, 9) . g⁡(z) is analytic on 0<|z|<r. f⁡(z)-g⁡(z) is continuous on 0<|z|≤r. have known asymptotic behavior as n→±∞. where σj is a positive constant. in the neighborhood of each singularity zj, again with σj>0. For higher terms see §18.15(iii). For uniform expansions when two singularities coalesce on the circle of convergence see Wong and Zhao (2005) . For other examples and extensions see Olver (1997b, Chapter 8) , Olver (1970) , Wong (1989, Chapter 2) , and Wong and Wyman (1974) . See also Flajolet and Odlyzko (1990) .